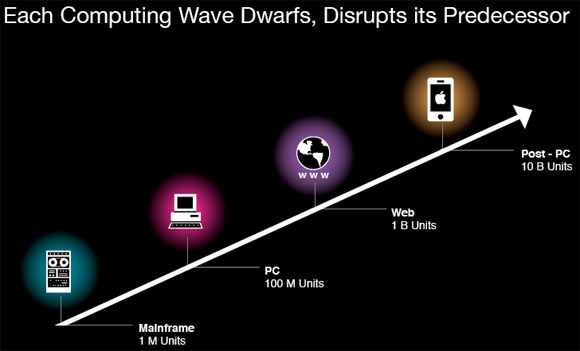 Killer Apps: the Defining Applications of Each Computing Wave — Open Source Strategies, Inc. The mainframe era was all about data processing. The defining app of the mainframe era was the database. Databases power all the big mainframe software which run airlines, banks, utilities, governments, and universities. It was these database-driven applications which made all those big organizations buy mainframes — even today. The PC made computing smaller — “personal” — and the defining app of the PC era was the spreadsheet. The Mac may have been cooler, but it’s not called the “PC Era” for nothing: Spreadsheets turned the personal computer from a toy into a ubiquitous business tool, which in turn drove the adoption of PC’s and turned Microsoft into a giant . Why do you use the web? Because of content. A recipe. An article. A post or tweet from a friend. The web is ultimately about content, and the defining app of the web era is the blog. The blog is the simplest, most popular content creation system, and its simplicity is helping us create content at a torrential pace. This vast ocean of content is what makes Google useful. YouTube, Facebook, and Twitter are really blogs in extremis: even simpler and more connected ways to publish content. And because of all the blogs, YouTube, Facebook, Twitter, etc., we’re on the web more than ever. So what will be the defining app of the Mobile era? Something which runs on smaller devices, is highly distributed, yet also highly connected, and very entertaining. psml! Are you sure you aren’t the Comic Book Guy from the Simpsons? Ha ha. Here’s to the Android’s Dungeon in all of us. I always thought spreadsheets were more versatile than word processing tools and more “strictly business”, so that’s why I chose it. Forums are less versatile than blogs, and also they existed in the pre-web era of dial up bulletin board services (BBS). Search engines are only useful because there is content, much of it created by blogs.